UPDATE: Virgin has now released a video of the flight, see below. SpaceShipTwo will carry six people in addition to two pilots, providing those on board with a view of space and several minutes of weightlessness once space flights begin. Eventual operational flights of SpaceShipTwo will occur from Spaceport America in New Mexico. Latest word is that the first passenger flights could begin in 2011. All the flight and all systems appeared to operate trouble free. After a clean release, Siebold completed initial flight handling and stall characteristic evaluation of SpaceShipTwo. After completing a practice approach and landing, Siebold made a smooth landing. 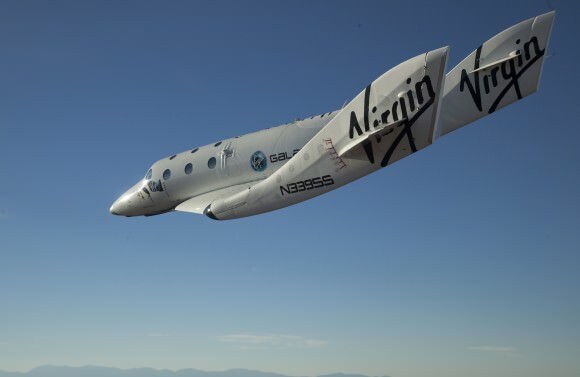 SpaceShipTwo and WhiteKnightTwo are being developed for Virgin Galactic by Scaled Composites, who built SpaceShipOne, the first privately-built vehicle to fly a person into space, which won the $10 million Ansari X PRIZE. Thanks again to UT speedy delivery, now I’m going to go dream of suborbital flight. So technically could this go to the space station and back or no because it’s not designed for atmosphere reentry? In order to reach the International Space Station, a space plane (or shuttle craft) will need to achieve the orbital velocity of the ISS, which is about 7.7 km/s; therefore, when descending, the spacecraft will have to re-enter the atmosphere at that velocity, utilizing its braking effect to slow down, which SpaceShipTwo is not designed for — it will burn up! So the answer is: No way, José. do you think this kind of reentry is possible? and how long would it take, given acceptable material stress. Wikipedia has a very detailed article on Atmospheric reentry, and one section of the article deals with the concept of “Feathered reentry“, which utilizes a “shuttlecock effect” with the suborbital SpaceShipOne, but it’s not viable for return from orbit. What a beautiful ship! Scaled Composites and Virgin Galactic will eventually build 5 of these ships, then perhaps more, depending on demand? An interesting side note is that there will be between 50-100 test flights prior to flying a paid passenger….AND Virgin Galactic will at first fly from their new spaceport in New Mexico but are looking into another spaceport to be located somewhere in England. Nice! It will get cheaper when other company’s arrive on the scene. Mr Branson what about an elevator to space or the moon. Keep it going , sky’s the limit! @RENOOR, you need tons of fuel to slow down from 27.700 km/h down to about 3.000 km/h about Mach 3 if you do not use aero-breaking. The number of test flights, many more than on SS1, should be because of the FAA license for passengers. On the difficulty to achieve orbit as opposed to suborbital super-Karman trajectories: I believe it takes ~ 5 times as much acceleration time (~ 10 minutes vs 2 minutes). I believe the acceleration is about the same, ~ 3g. So one order of magnitude difference. Another way of comparing is cost. ~ 0.2 MUSD for an SS2 ticket as opposed to ~ 20 MUSD (IIRC) for an ISS ticket. That is a 2 order of magnitude difference. Maybe the later doesn’t map well to fuel (infrastructure) needed, but at least these back-of-the-envelope indicators gives that it is 1-2 order of magnitude more difficult to reach orbit. Actually…. mmm… once you’ve reached the upper atmosphere you pitch over to just below horizontal and fire another rocket. Diving back into the atmosphere SCRAM jet speeds are obtained. The rocket engine reshapes itself and converts into a scram jet engine which continues the acceleration curve to half orbital speeds. At the top of that trajectory the SCRAM jet reconverts back into a rocket and fires up once more…. A reverse scram-jet to break in the atmosphere, sounds nice, but you still need extensive fuel to burn. Also the G levels might exceed living safety levels in order to dip into the atmosphere in order to get enough air for the scram jet to operate. Aqua: it would also be nice if anyone could make a scram jet that didn’t become forever unusable after a couple minutes… The Scramject tech is very early in it’s infancy – if it ever becomes cost effective. This is very nice and the pictures indeed look futuristic! For me personally though, the cost and suborbital heights are a deal breaker. My sweet spot is $10 000 – 15 000, including 12 hours orbital and 1 spacewalk. Offer me this and I’ll sign up right away! Maybe in a few decades lol.